TMNT Entity: Sorry about the comments filter! Sorry about the comments filter! Someone contacted me recently to tell me that my comments hadn't been getting published on the site. Holy CRAP. There were comments from mid-June that were still waiting to be published! I dunno what happened. I'm supposed to get an email notification whenever there's a comment submitted so I can vet it (I get a lot of spam). I hadn't been getting those emails so I figured no one was commenting anymore. Damn. Well, I've published all those pending comments (except the spam), even the one by that dude who called me a racist (I wuv you, too). My apologies; I'll check my Blogger settings and see what went wrong. A BIG THANKS to everyone who commented with support on my 10th Anniversary Article! Your words of encouragement mean a lot! I missed the comments section. Congratulations again and good luck on all of your endeavors. 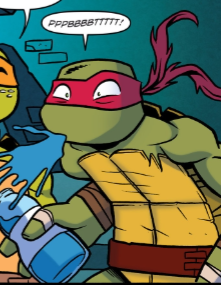 Thank you for creating this site and bringing together all the TMNT fans together. I guess I figured you wanted the anniversary post to stand on its own and didn't want to color it. Glad it was just an oversight! I love this blog so much! I wasn't sure what's going on, so I did one or two and left well enough alone. I should realized it was only a tech issue, but, in fairness, some people really do wake up one day and go "I don't want to do comments, anymore," as it is the new hotness among paid professional sites, like the New York Post or the Atlantic. Personal blogs, of course, are a different story. I view it more as "I'm a guest at someone's house," so I try to act as such when commenting here. And I'm glad I still can, thanks to Mark's clarification. Not much else to say, but I'll second what Adam and Mystery said. Whoo. Making a new blog, I realized there was a section in settings somewhere that controls wether or not someone can comment on the blog. Maybe there's a similar setting like 'email alerts when comments' or whatever that was somehow flipped off in an update. Gotta love those game-breaking updates.